If I ever get tired of metallics, it certainly won't be before Christmas! While copper is my favourite, I also have a great fondness for gold and silver so, not being able to choose between them, I made one card in each colour! While the colours are different, the methodology is the same for each card and it's quick and simple! The base card is a piece of A5 card folded in half with a metallic layer (corresponding to the heat embossing I used) on top. I started by giving the top layer a good wipe with my embossing buddy, stamped the ground piece with Versamark and heat embossed it. 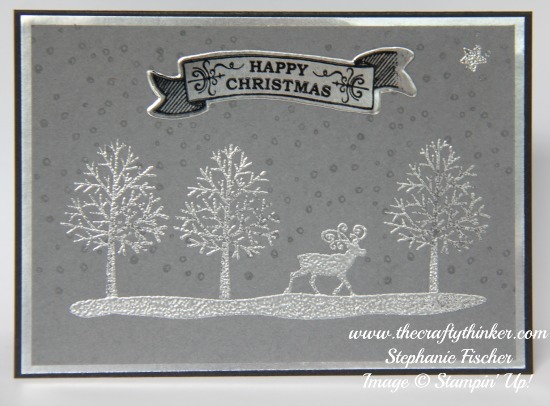 I then heat embossed the trees and reindeer, being careful to avoid over-heating the ground section. 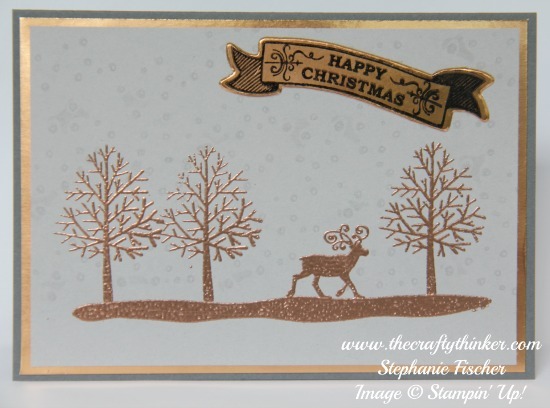 I added the snow by stamping in Versamark. 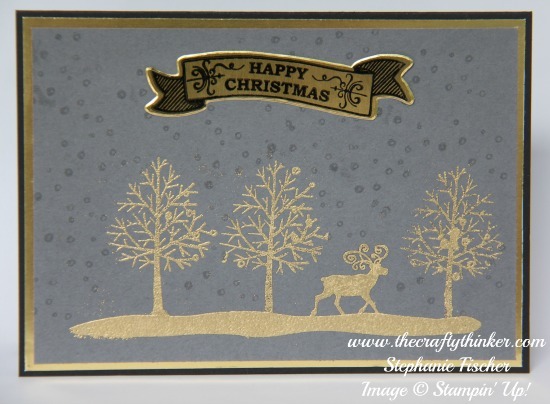 Whilst copper remains my favourite metallic, I'm not sure I like it so much in this card! I stamped the banner in Stazon ink onto corresponding metallic foil sheet before cutting out with the matching die from the Bunch of Banners framelit set. I know, here in Australia, Christmas is in Summer but I still like a traditional wintry scene on Christmas cards!